For advanced technology and high-speed performance the CLe Series printers have no match in the industry. Built in the tradition of SATO's rugged dependability the CLe Series printers are based on RISC processors delivering high-quality images at high speeds. CL408e, Thermal transfer, 203 dpi, 6 ips, 4.1" print width, Ethernet interface, 16MB RAM, 2MB Flash. Includes rotary cutter, WPC Plus printer control server & US power cord. 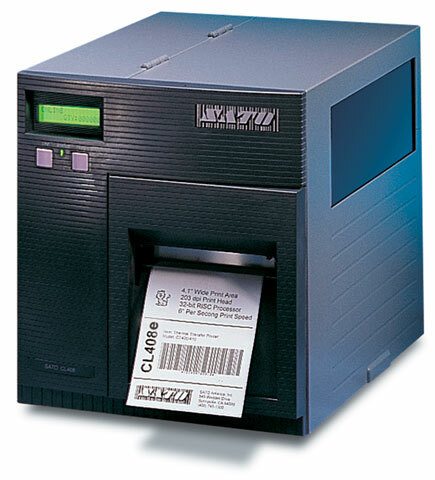 CL408e, Industrial thermal transfer printer, 203 dpi, maximum print width 4", Interface Options: Ethernet, 16MB RAM, 2MB Flash. Includes WPC Plus printer control server & US power cord. See accessories for cables as they are sold separately. For advanced technology and high-speed performance, the CLe Series printers have no match in the industry. Built in the tradition of SATO's rugged dependability, the CLe Series printers are based on RISC processors, delivering high-quality images at high speeds. <<$mfg->name>> CL408e High-Performance, High-Value Printers For advanced technology and high-speed performance, the CLe Series printers have no match in the industry. Built in the tradition of SATO's rugged dependability, the CLe Series printers are based on RISC processors, delivering high-quality images at high speeds.